The Women of Beer collaborations have been growing wings. In Australia, what started as a Victorian venture has spread nationwide, while the Pink Boots Society kickstarted in the US now has branches worldwide, including more and more in Australia. This year, the collaboration brew day that took place on International Women's Day led to five brews in Australia and there's also this spin off brew too. 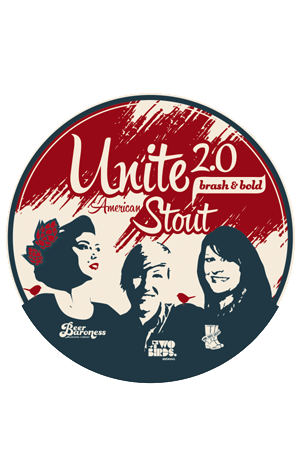 Unite 2.0 took place when Two Birds' head brewer Jayne Lewis was in New Zealand last August and hooked up with two other movers and shakers from the Pink Boots Society. They came together at Four Avenues Brewing Company in Christchurch where Jayne joined forces with Ava Wilson of Beer Baroness in New Zealand and Denise Ratfield of Stone Brewing. The trio created an American Stout, with each of the ladies selecting a hop from their own country: Waimea (NZ), El Dorado (USA) and Enigma (AUS). It's described as "brash and bold, rather like the women who brewed it" and is being sold to raise funds for the newly formed Pink Boots Society – NZ. Just two kegs have made it to Australia, with the first tapped at the Two Birds Nest.